The intensive production agriculture has meant the development of isolated environments that benefit the development of pests, an easy source of food. And the repeated and indiscriminate use of pesticides has modified a natural environment in which pests were controlled by their predators. In addition, markets have forced the selection of certain varieties of crops by farmers, plant breeders, and hybrid producers, so that many of the cultivated varieties have been losing part of the natural defense mechanisms acquired over millions of years in that slow co-evolution process. Erroneous or late identification of the pest. Generally, nymphs and larvae are more difficult to identify than adults, but if the pest is not correctly identified, it will be very difficult to apply an effective control strategy. 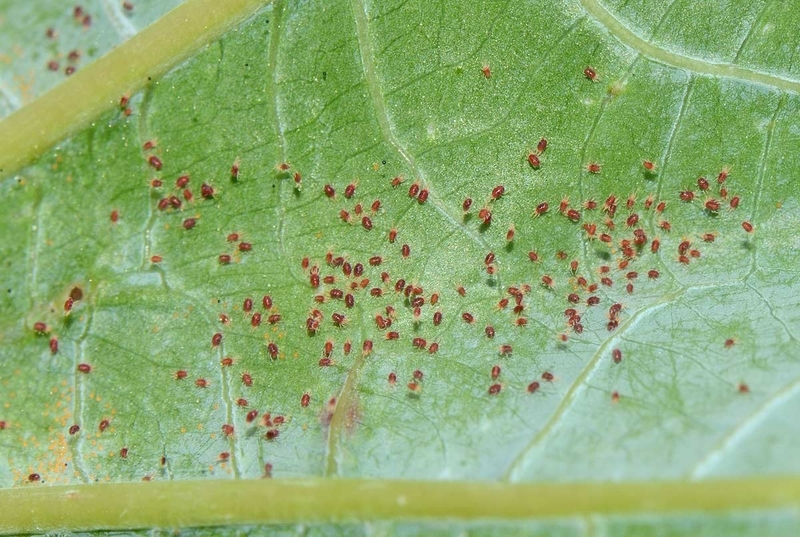 The easiest way to identify a pest is when damage to the plant is done, but that time is usually late to perform a treatment, and the population dynamics of the pest could not be controlled. The trade globalization of plants and crops is causing pests to move into new environments, in which they are not easily identifiable and lack their natural predators. Late treatments due to unknowing the cycle of the biological development of pests. To effectively controlling pests crops, forests and ornamentals it is essential to know their habitat, their eating habits and their different stages of development. 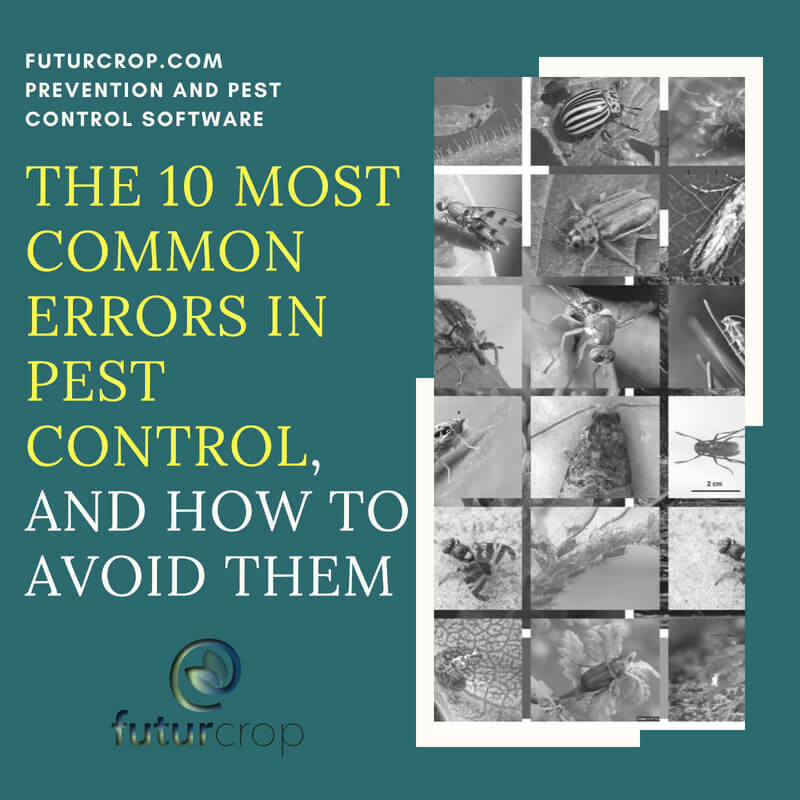 It is particularly useful to know the stage of development in which the pest is most vulnerable so that the treatment is efficient from its first generations. 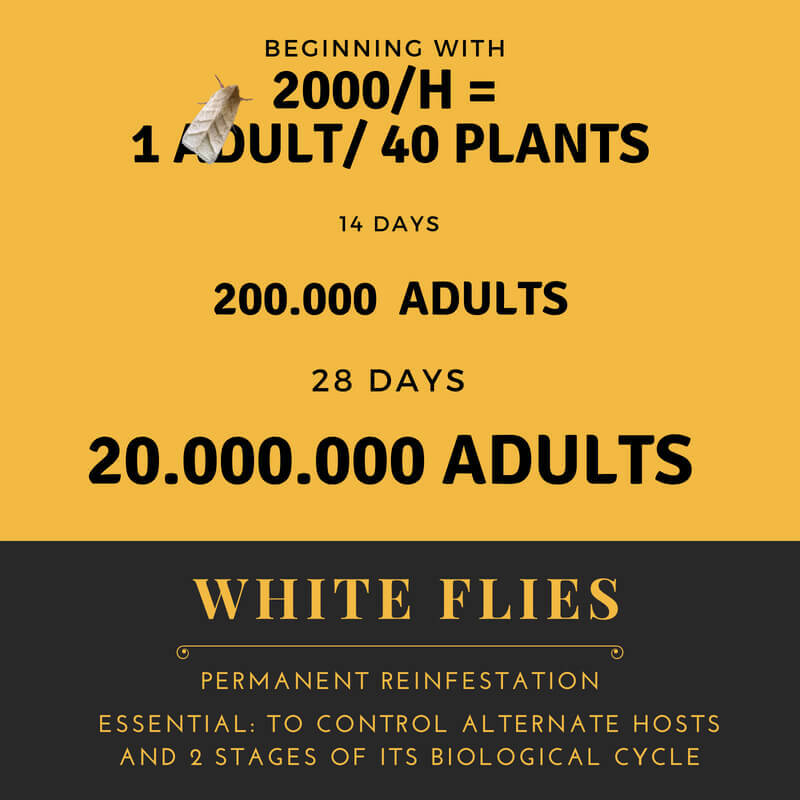 Generally speaking, during the adult phase the pests are treated with little success: they tend to be more resistant to pesticides and could already have deposited the eggs and started a new generation. Environmental conditions such as humidity, temperature, etc., as well as the availability of food, can affect the life cycle of insects, thus pest control actions. Average times required for the development of different pests are known (for example, 10 days for the complete cycle, at an average temperature of 23ºC), but Climate Change makes such calculations worthless. Autmatic monitoring of weather conditions must be done daily in order to reduce the risk of pest infestation, because an increase in temperatures causes the pests biological developmentto shorten in terms of days. The qualification of phytosanitary to describe pesticides is subtle, and usually used by laboratories, but does not remove any toxicity to the products. Phytosanitary products are poisonous substances. According to the World Health Organization (WHO) there is no pesticide that lacks toxicity. In fact, the lethal doses of each active ingredient of the pesticides are determined. WHO defines the degree of dangerousness according to the average lethal dose, which is the amount of the pesticide, in mg / kg / day, which causes death in half of the experimental animals (usually laboratory rats), and the results are extrapolated to human beings. But the accumulated effect of the chemicals we ingest through water, food, etc., is unknown. Especially vulnerable to the effects of pesticides are pregnant women, children and elderly people. For this reason, pesticides should be the last resource in the integrated control of pests, always respecting the doses and deadlines set by the WHO and indicated by the manufacturer. For different reasons, the repeated and indiscriminate use of pesticides in pest control should be avoided. Because of its potential danger, Food and Agriculture Organization (FA0 ) published in 1985, and periodically revise, the International Code of Conduct for the Distribution and Use of Pesticides, although its compliance is voluntary by countries, producers and distributors. To consider the use of pesticides as the only treatment for controlling pest. Chemical control is the simplest and fastest method for agriculture pest controlling, although it costs between 3% and 11% of production depending on the crop and the type of production. It consists of the preventive and repeated applications of a variable set of broad-spectrum pesticides, with predetermined doses, and according to the calendar dates, to the crops and the pests that potentially affect them. These treatments are applied according to calendar dates, even when the pest or disease is not present in the crop. The exclusively chemical control is the most likely to cause harmful effects: it can generate resistance to products in the pests themselves, with the consequent increase in production costs, can affect the health of the producer and its workers, if strict security measures are no taken, aerial applications can affect nearby populations, and can have negative environmental impacts, such as water and soil contamination, reduction of biodiversity and the extermination of the predatory fauna of the pests themselves. Not to use protective equipment, or an erroneous use of it. As a legal requirement, in most countries, pesticide manipulative and applicative need mandatory training, with strict regulations regarding clothing, handling, etc. FAO published in 2002 a guide on the minimum requirements for the application of pesticide:. Guide on Good Practices for the Terrestrial Application of Pesticides. Some inappropriate procedures carried out with pesticides, such as preventive applications of insecticide, treatments established according to calendar dates, the application of erroneous doses, or increasead the number of applications have favored certain species of pests to develop resistance to chemical insecticides. In many cases pests adapted to the pesticides used for their control, surviving and generating future resistant individuals. Until the 1950s the number of insect species resistant to any of the chemicals that were used to control them was small. But with the generalization of the use of pesticides as the basic way of pest controlling, and its massive use since the 1980s, insect resistance to chemicals has already been documented in more than 500 species. According to WHO, as estimates made in 1986 (Informal consultation on the planning of a pesticide poisoning prevention strategy), each year one million people are poisoned with insecticides and 20,000 die because they ignore the risks involved in handling them. Appart from risks to human health, improper storage of pesticides has a direct impact on their effectiveness, therefore the products must be stored in their original packaging with the corresponding label and must take into account fundamental aspects related to temperature or location, as FAO published: Manual on the storage and control of pesticide stocks. For years, pesticide containers have been thrown away without proper treatment, reused them (with serious health consequences, such as driking water containers) thrown into rivers or burned in the open air, generating toxic fumes. These practices have caused environmental pollution and not a few intoxications in humans and wildlife. Frequently the containers with pesticide residues are cleaned in the rivers, causing serious problems of water pollution.